From harvest to processing, storage to shipping, keeping mussels safe and ensuring traceability is a top priority of PEI Mussel farmers. 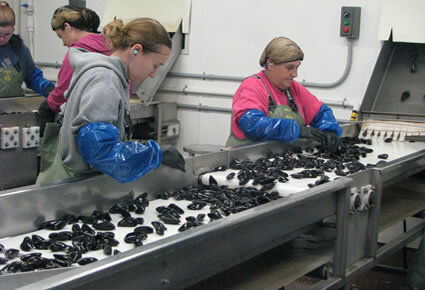 PEI Mussel farmers are committed to producing a safe and healthy product. They deliver mussels using strict safety protocols, and work to help consumers learn the facts on storage and preparation. Prince Edward Island mussel farmers work closely with the Canadian Food Inspection Agency and regional food safety organizations to ensure the production of only the finest, fresh, blue, cultured mussels. Fresh mussels have a federally regulated tagging system that tracks mussels through the supply chain. These tags record the date when the mussels were harvested, the location of the harvest, and when they were shipped. You can literally track the history of each mussel from seed to your plate. PEI Mussel farmers follow extensive site selection procedures and integrated coastal management planning with coastal stakeholders. Strict seafood safety policies, regulations, inspection standards and initiatives, including a quality management program, ensure mussels are kept free of foreign organisms and harmful bacteria and toxins. Monterey Bay Aquarium, a world-renowned research and display centre, has labeled PEI Mussels a "best choice food." This is because our mussels are good for the body... and the earth. The fastest way to check if mussels are still fresh is by smell: the salty aroma of the ocean should be present as you open the mesh bag grocers typically use to contain them. Always remember the "tap" rule: When you're ready to cook mussels, rinse them in fresh water. If there are any that don't close, give them a quick tap. If they still don't close, at least partially, discard them. You don't have to cook mussels as soon as you buy them, and you can keep them in your fridge safely for several days.